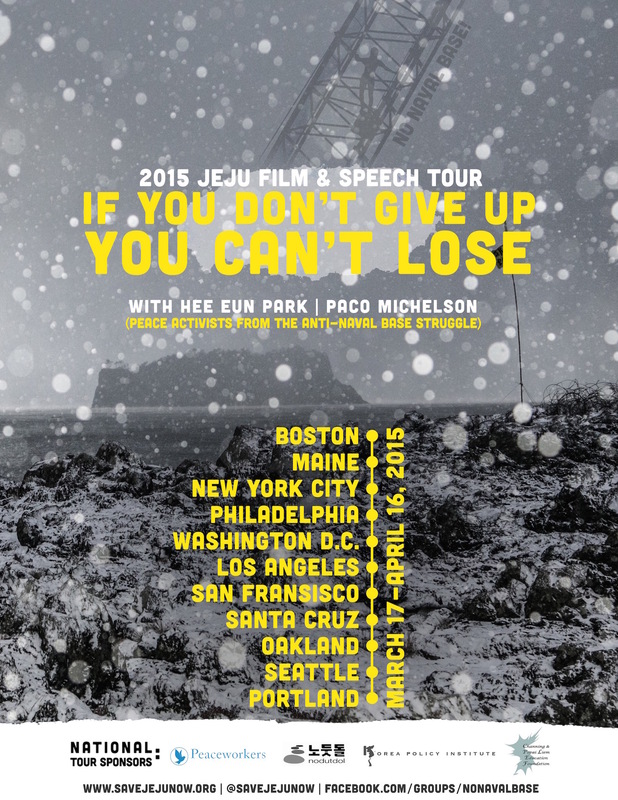 Hee Eun “Silver” Park and Paco Michelson, peace activists from the Jeju Island Anti-Naval Base struggle will be traveling across the US in March and April to share the story of the struggle through the screening of a new full-length documentary, and speaking about their personal experiences on Jeju Island, Korea. 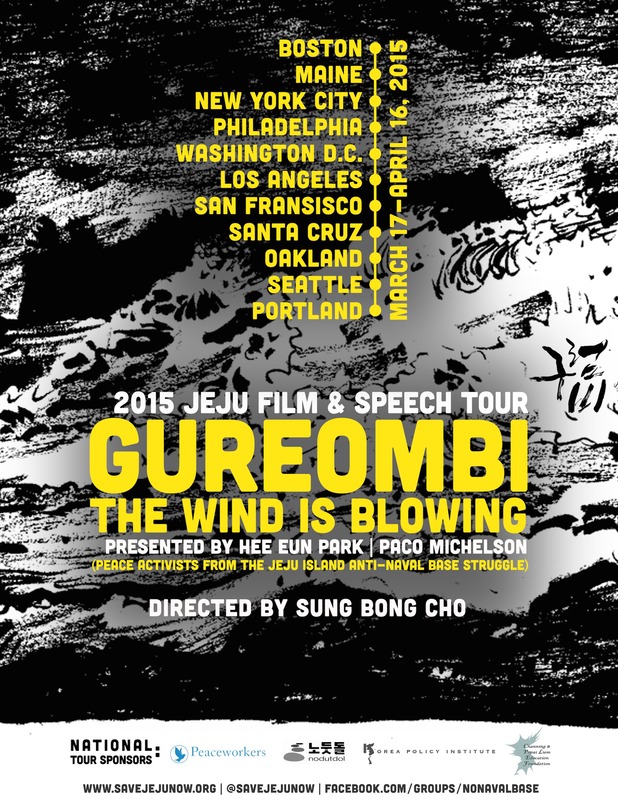 At some events, Silver and Paco will be presenting the film of Korean director Sung Bong Cho, Gureombi, The Wind is Blowing followed by a Q&A. 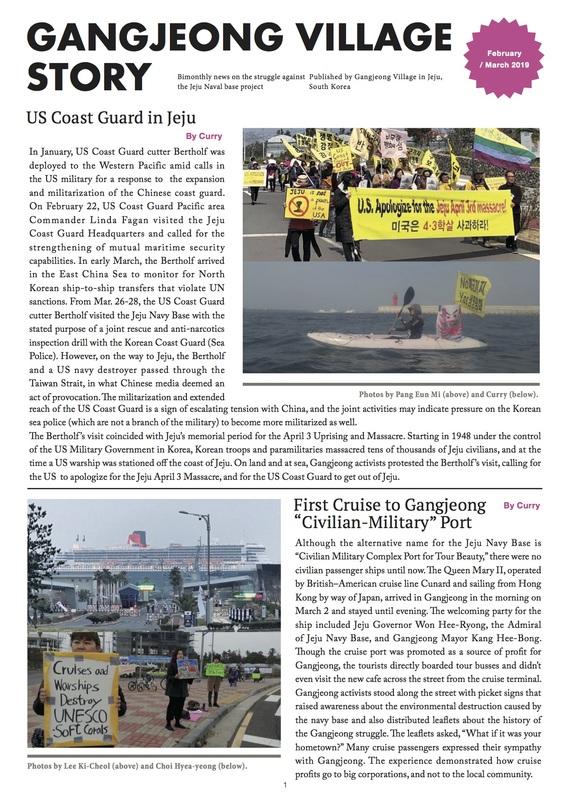 At others, they will be speaking about the situation and struggle as well as sharing their personal experiences and those of their friends on Jeju, with a presentation titled, If You Don’t Give Up You Can’t Lose. At all events they will be raising support for legal costs of the activists and villagers of Gangjeong. Many of Gangjeong villagers are farmers whose struggle for justice has meant sacrificing their crops. Many Gangjeong supporters work full-time for the struggle and rely on odd jobs and occasional field labor to survive. The fines are increasing and many people owe thousands of dollars they cannot afford to pay. Come out to an event in an area near you and hear the story, see the struggle, and donate to the brave peacemakers who are giving everything they can in this fight for justice. Click on a location to go to that locations section in the list. All events listed below are open to the public. There are occasionally non-public events as well, check with your local groups in your area for details on those. Please come out, invite your friends, and share this to your networks!